The Black Gold line from Dynasty Brush is our finest line of brushes, with the highest quality synthetic hairs, seamless metal ferrule and smooth varnished wood handle. 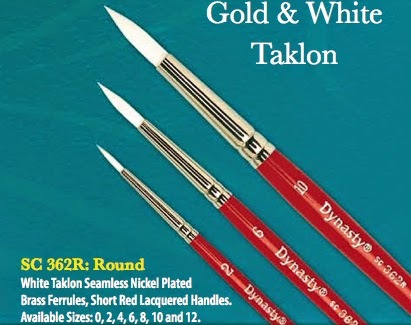 The long-handled series is perfect for fine oil painting, acrylic work and alkyds as well as faux finish work and decorative work. There is a large selection of shapes and sizes, including brights, filberts, flats, rounds, fans, and shaders. If you're needing a short handled brush, the Black Gold series comes in these shapes and more. Featured artist, Jennifer Redstreake Geary uses Black Gold in her watercolor workshops and on her own paintings. She shares that her brushes last longer and her work is better, using the Black Gold series. To find Black Gold brushes near you, log on to our website and check out the Distributor Locator.